ICLEI was formed in 1990 for the purpose of promoting the UN’s vision of “sustainable development” as embodied in a document called Agenda 21. It now counts more than 1200 cities in its membership, the vast majority of whom use taxpayer money to pay membership dues to participate. 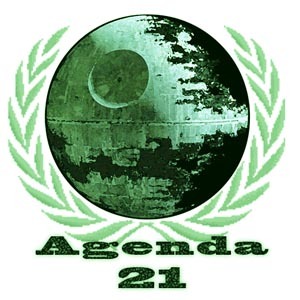 Agenda 21 wears a green cloak of caring and happiness to hide its much darker trappings. By utilizing universal concerns such as the environment and the economy, this United Nations program has co-opted legitimate activism to create a many-tentacled beast that aims to get it hooks into local communities across the globe . . . by stealth. The 4th Global Forum on Urban Resilience & Adaptation was recently held in Bonn, Germany. According to a press release from CFACT: Committee for a Constructive Tomorrow, delegates assembled for the International Council for Local Environmental Initiatives (ICLEI) are “dismayed over growing grassroots opposition” to Agenda 21. For those of you who have focused on “Choose Freedom, Stop Agenda 21!” Your efforts have made a huge difference. Consider what you have done a great foundation from which to work from. Continue to educate your elected officials on their duty to protect private property rights and how the best stewards of the land are the owners themselves. following is a direct quote. that will be used to accomplish it. property owners of the community. Perhaps we should be pleased that the Findlay-Hancock County area is so appealing to the federal and state bureaucrats.We are blessed with prime farmland, lucrative businesses, beautiful environment and conservative values. Unfortunately, like the beauty of a damsel, this status has become a curse in that there are those socialistic sustainable development moguls who want to defile the very core of our habitat. Beware, this is just not a politically motivated goal of the governor but also of some of our own elected officials.Those very people who we entrusted with our life, liberty, and pursuit of happiness are in cahoots with the sustainable establishment. The promise of power and government monies has blinded these elected officials to their constitutional responsibilities.We must stand against these foes of our constitutional liberties, even if it means that we will be yelled at or threatened with lawsuits. We did good by electing two men, possibly three, to the Findlay City Council, who will stand with us in this fight to retain our God-given liberties. We must become informed and involved in the issues which affect our livelihood.The Army Corps of Engineers has been notorious in flooding prime farmland for the sole purpose of seizing land, if even by eminent domain. Do not let this happen to our community.Start attending the City Council meetings and get to know those councilmen (women) who are bent on selling us out, and do not re-elect them! With the diluting of terminology, one can label a person a liar, which is a harsh connotation, or one can refer to a person as telling a fib. The media uses this tactic in presenting propaganda designed to slant the perception on a particular sensitive issue. The liberal agenda is now known as progressive, a more positive connotation. The same scenario has taken place in reference to the sinister “Agenda 21.” The liberal, I mean, progressive, media is now labeling it as “sustainable development” because Agenda 21 became a dirty word. Now, the proponents of this unconstitutional infringement upon our rights are desperately trying to separate the two entities. Agenda 21 accusations should not only delay future projects that would lead to property loss and livelihood of Findlay residents, but it actually needs to stop this iron-armed outreach of the United Nations from getting a hold in our community. Findlay and Hancock County fall under the authority of the Toledo Metropolitan Council on Governance, which is tied to sustainable development, which in turn is one of the iron-arms of the United Nations. Via the so-called flood control, these charlatans want to seize prime farmland in our area. Folks, do your homework! This issue is all about control, government-grabbing land control. I would be discouraged to think the only folk who know about this impending danger are the members of the Findlay 9.12 group. In reality, there are many, many more! These citizens have taken the initiative and the time to research Agenda 21, sustainable development and common core indoctrination. They are armed with the truth and their only goal is to educate their fellow citizens. By the way, the citizens of Fostoria have chosen not to have affiliation with Toledo governance. Smart move! Unfortunately, within Findlay city government are folks who like federal power and dollar signs to the extent that they will ignore the wishes of those who elected them to their office. Government is meant to protect its citizens, whether federal, state or local. As citizens of Findlay, we need to hold our elected officials accountable!